It will easily outperform the market in 2016 and if you buy in today you will be able to participate in years of growing shareholder value from this tech behemoth. If you do not have this stock in your portfolio you are making a big mistake. 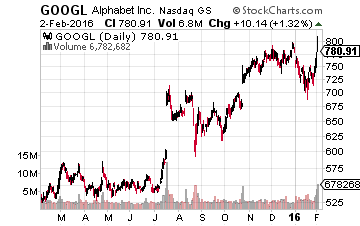 Alphabet (NASDAQ: GOOGL) the new holding company for Google reported after the bell on Tuesday. The company crushed both bottom and top line expectations by beating earnings per share estimates by 58 cents a share on better than a 17% increase in revenues. The stock has even overtaken mighty Apple (NASDAQ: AAPL) to become the biggest public company by market capitalization. Although its valuation is a bit higher than I usually like to pay for large cap growth stocks, the recent changes the company has made are likely to pay off in long-term capital appreciation for its shareholders. Given the current anemic global environment, this growth play belongs as core holding in any well-diversified portfolio. Below you’ll find my analysis on why Alphabet should be a core holding in every portfolio. The stock is the cheapest by valuation of all of the so-called FANG stocks at roughly 22 times forward earnings, which is a tad more than the 20 times forward earnings multiple they started 2015 with. [ad#Google Adsense 336×280-IA]However, the company has done several things in 2015 that merit a higher multiple. In addition, if you take out the huge gobs of net cash that sit on Alphabet’s balance sheet, the multiple is really more like 18-19 times forward earnings. This is a slight premium to the overall market which on average does not have this company’s long-term growth prospects. I expect this be able to deliver earnings and revenue increases in the mid-teens for the foreseeable future. It has all the traits, outside a dividend yield, that one should look for in a true “buy and hold” position. Let’s start with the fact that Google totally dominates the domestic search market both here, in Europe, and in many other countries and regions. It has roughly two-thirds of online search market both here and in Europe. It has an even higher (>80%) of the mobile search market in both regions, which of course has drawn the ire of European regulators who have grown frustrated by a lack of a Eurocentric “champion” emerging in this space. This dominance in the search market and the migration of internet traffic more and more to the mobile medium which Google dominates has led to a dramatic increase in mobile and online ad revenue. Facebook (NASDAQ: FB) and Google are the two heavyweights in these areas and are the beneficiaries of more and more of the overall ad dollar moving from television and radio to online and mobile channels. This is a trend that is firmly established and should continue to play out for the foreseeable future. As can be seen from the chart above mobile advertising has exploded onto the scene over the past five years. Almost the entire growth in advertising since the recession ended in 2009 has gone to these two components of digital advertising. The chart below clearly demonstrates that this channel is capturing more and more of the overall advertising dollar. This is a trend that will continue to play out in the years ahead. This type of advertising is growing at such a clip as it gives marketers many advantages over traditional TV and radio spots. The marketer knows much more about its potential customer such as demographics, what sites the customer previous viewed, etc…which is not available via traditional mediums. This allows the marketer to better customize more effective and niche advertising campaigns. In addition, a customer can click on an ad and instantly be able to order the advertised good in most cases. Obviously, this is a capability that TV and radio can’t match. This is a space that Google and Facebook have dominated as it has grown. Due to the network effect, it is hard to imagine another entrant being able to displace either firm from its dominant position. While this is the main reason we want to have Alphabet in our portfolio, it is not the only one. The company brought in a new and experienced CFO from Morgan Stanley into the firm this year which has imposed some adult supervision to what has been a startup culture. The changes she has already made have created shareholder value and will continue to do so in the future. She helped lead the charge to split off Google’s more speculative businesses into separate companies underneath the parent company for greater transparency. In addition, the new CFO has gotten expenses under control. In the last reported quarter expenses grew nine percent year-over-year down from 28% in the same period the prior year. Starting in the New Year, the company will start to break out revenues from the main parts of the company. This should create shareholder value and a greater multiple for the stock just as it did when Amazon (NASDAQ: AMZN) started to break out the contributions from its web services division this year. The company’s YouTube ownership is a very undervalued asset. Only Facebook has more than the 1.3 billion active users that YouTube can claim. This compares favorably to the 70 million subscribers that Netflix (NASDAQ: NFLX) can claim. Youtube is also seeing faster growth than either noting earlier this year that viewing time had increased 60% year-over-year while mobile viewership had doubled. Youtube brings in some 15% of the company’s overall revenue which is approaching $75 billion this fiscal year. That number could grow to 25% of overall revenue five years hence if the company can double revenue per Youtube user over that timeframe which seems possible given how fast advertising dollars are migrating to digital channels especially video. Think about this, YouTube is producing nearly $9 billion in revenue, more than $2 billion more than Netflix which has a market capitalization of $50 billion. Assigning a per user value along the lines of Twitter (NYSE: TWTR), which seems conservative, values YouTube at $100 billion on this part of the company’s business or about 20% of the Alphabet’s overall market capitalization. Not bad given YouTube was purchased for less than $1.7 billion nine years ago. The newly christened Alphabet as outlined above has many different growth drivers that bode well for the continued creation of shareholder value in the years ahead. The company has also discovered financial discipline in 2015. Although not cheap, the stock isn’t expensive either given its long-term growth trajectory, unassailable position in search, rock solid balance sheet, and the continued migration of the advertising dollar to the digital domain. Recommendation: Buy GOOGL up to $825.00 a share.